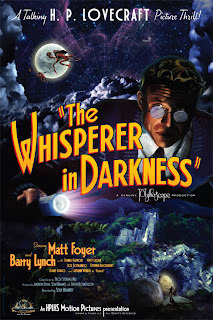 The goals that the filmmakers responsible for THE CALL OF CTHULHU and THE WHISPERER IN DARKNESS set for themselves would be ambitious even for a major studio production. First and foremost, they mean to be faithful adaptations of the works of H.P. Lovecraft, a writer whose stories generally involve concepts not easily translated into cinematic form. Secondly, these adaptations are meant to appear as if they were made at roughly the same time as the stories were published. In the case of CALL that's 1928, necessitating a silent film; for WHISPERER it's 1931, the same year that Universal Studios was beginning their horror cycle with DRACULA and FRANKENSTEIN. That they manage to be largely successful in these goals while working with incredibly small budgets (we're talking well under a million) is even more remarkable. CALL OF CTHULHU was released in 2005, predating THE ARTIST by 6 years. Shooting on digital video rather than actual film stock, there is no way that director Andrew Leman could have produced as authentic a recreation of 1920's cinema as the Oscar winning Michel Hazanavicius film, but his results are still pretty impressive. A few anachronistic CGI effects break the spell on occasion, but for the most part the acting, cinematography, and overall feel of the film is very much in the spirit of silent horror classics like NOSFERATU and THE CABINET OF DR. CALIGARI. 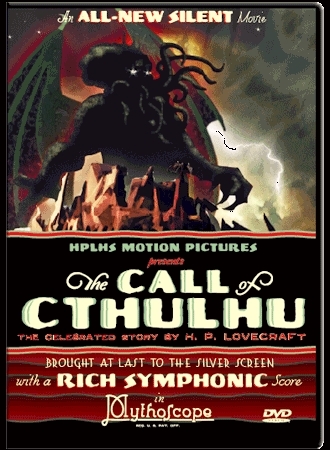 The details of Lovecraft's plot are faithfully conveyed in the script by Leman and co-writer Sean Branney, with Leman's direction giving the tale a little more dramatic drive than the source material. Overall, it's a solidly entertaining experience that should please Lovecraft fans and aficionados of classic horror films alike. 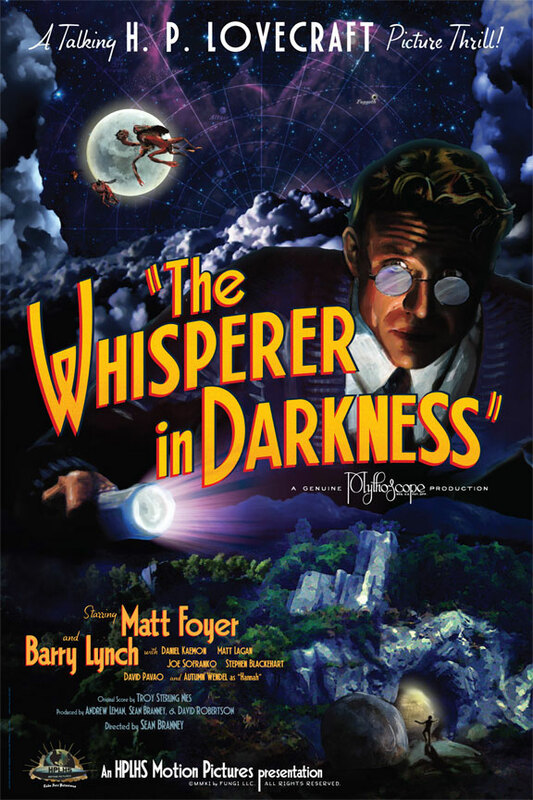 Although it doesn't succeed in its stated goals quite as well, THE WHISPERER IN DARKNESS is arguably the more enjoyable of these films. A few moments here and there do recall the Universal horror films of the thirties that WHISPERER is ostensibly trying to imitate, but for the most part this feels more like forties horror films like THE WOLF MAN and Val Lewton's CAT PEOPLE crossed with the noirish sci-fi horrors of the early fifties like Don Siegel's INVASION OF THE BODY SNATCHERS and Jack Arnold's IT CAME FROM OUTER SPACE. It may not be as advertised, but this approach feels far more appropriate than the campy and generally stage bound approach of thirties horror films. For WHISPERER, Branney and Leman once again collaborated on the script, with Branney getting his turn in the director's chair. The script expands on Lovecraft's original plot, even going so far as to add a substantial female supporting character. Still, the essence and tone of the story, as well as its major shocks, are intact. As in CALL, the illusion of seeing some lost classic is spoiled by some CGI effects. In a perfect world, Ray Harryhausen would have done stop motion effects for this just prior to his death, or barring that, maybe Bob Burns could have whipped up some appropriately retro rubber suits to depict the films alien monsters, but the former approach would have taken too much time and money, and the latter would have looked even cheesier, even if it were more historically accurate. All in all, hard to complain about the choices that were made here given the budget. CALL OF CTHULHU: 3 out of 4 stars. THE WHISPERER IN DARKNESS: 3 1/2 out of 4 stars.